^ Hakim, Joy. A History of Us: War, Peace and all that Jazz. 紐約: Oxford University Press. 1995: 100–104. ISBN 0-19-509514-6 （英语）. 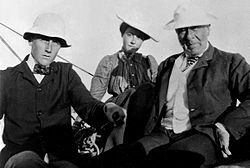 ^ ROOSEVELT - Surname Meaning, Origin for the Surname Roosevelt Genealogy. [2007-11-23] （英语）. ^ Patrick D. Reagan. Designing a New America: The Origins of New Deal Planning, 1890–1943. Univ of Massachusetts Press. 2000: 29. ISBN 9781558492301 （英语）. 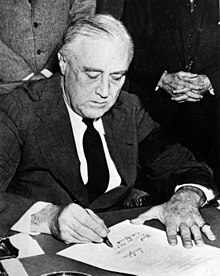 ^ 9.0 9.1 Question: How was ER related to FDR?. The Eleanor Roosevelt Papers. [2013-12-18]. （原始内容存档于2002-12-04） （英语）. ^ Not in My White House: French-Style Divorce Unthinkable Here. ABC News. [2007-10-19] （英语）. ^ James Roosevelt. Eleanor Roosevelt National Historic Site. 2003 [2003-03-02] （英语）. ^ Elliott Roosevelt. Eleanor Roosevelt National Historic Site. 2003 [2003-03-02] （英语）. 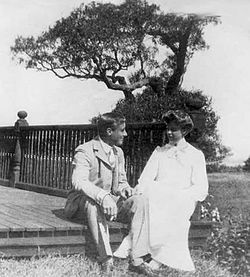 ^ Franklin D. Roosevelt, Jr.. Eleanor Roosevelt National Historic Site. 2003 [2003-03-02] （英语）. ^ John A. Roosevelt. Eleanor Roosevelt National Historic Site. 2003 [2003-03-02] （英语）. ^ It's Just a Woof Over Their Heads; At the White House, Canine Carrings-On. 华盛顿邮报. 1989 [2008-11-05] （英语）. 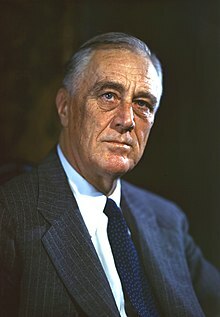 ^ FDR Biography - Early Political Career. Franklin & Eleanor Roosevelt Institute. [2008-03-04]. （原始内容存档于2008-03-12） （英语）. 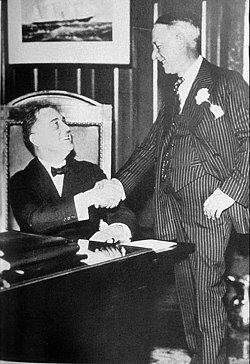 ^ Roosevelt's Entry Into Politics. 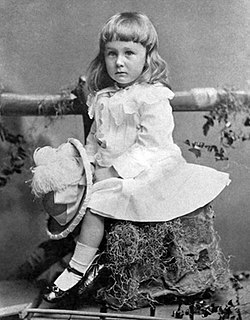 Franklin D. Roosevelt. Spark Notes. [2008-03-04] （英语）. ^ Circulating Coins - Dime. 美國鑄幣局. [2008-10-11] （英语）. ^ Reiter, Ed. 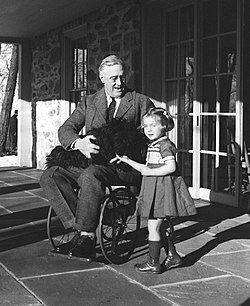 Franklin D. Roosevelt: The Man on the Marching Dime. PCGS. 1999-06-28 [2008-10-11]. （原始内容存档于2008-08-20） （英语）. ^ Whitman, Alden. Farley, 'Jim' to Thousands, Was the Master Political Organizer and Salesman. 紐約時報. 1976-06-10: 64 （英语）. ^ History of the Ten Mile River Scout Camps. TMR Scout Museum. [2008-02-15]. （原始内容存档于2008-03-12） （英语）. ^ Roosevelt Honored by the Boy Scouts. 紐約時報. 1930-08-24: 21 [2008-04-22] （英语）. ^ Campbell, Thomas P. A Best Friend in the White House. Scouting (magazine). Boy Scouts of America. 2003 （英语）. ^ Roosevelt's Nomination Address. Franklin and Eleanor Roosevelt Institute. 1932-07-02 [2009-01-20]. （原始内容存档于2009-01-13） （英语）. ^ Collins, Robert. More: The Politics of Economic Growth in Postwar America. Oxford University Press. 2002-04-04: 5. ISBN 978-0195152630 （英语）. ^ Sternsher, Bernard. The Emergence of the New Deal Party System: A Problem in Historical Analysis of Voter Behavio. Journal of Interdisciplinary History. 1975, 6 (1): 第127–149頁 （英语）. ^ Gibbs, Nancy. When New President Meets Old, It's Not Always Pretty. 時代雜誌. 2008年11月10日 （英语）. ^ Alter, Jonathan. 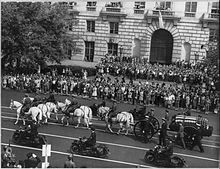 The Defining Moment: FDR's Hundred Days and the Triumph of Hope. Simon and Schuster. 2006-05-02: 190. ISBN 978-0743246002 （英语）. ^ Kennedy, Susan Estabrook. Bottom (The Banking Crisis of 1933). 時代雜誌. 1933-03-13 [2008-03-02] （英语）. 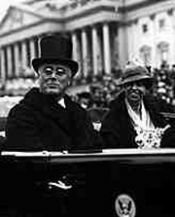 ^ Franklin D. Roosevelt - First Inaugural Address. Inaugural Addresses of the Presidents of the United States. Bartleby.com. [2008-03-02] （英语）. ^ Roosevelt, Franklin Delano. First Inaugral Address. Wikisource. [2003-03-02] （英语）. ^ Samuelson, Paul Anthony. John R. Coleman, Robert L. Bishop and Phillip Saunders, 编. Readings in Economics. McGraw Hill. 1964: 140. ASIN: B000LILNBQ. ^ Hawley, Ellis. The New Deal and the Problem of Monopoly. Princeton University Press. 1966: 第124頁. ASIN: B000RB44GI （英语）. ^ Gold Confiscation: Will it happen again?. Blanchard Online. [2003-03-02]. （原始内容存档于2007-02-11） （英语）. ^ Gnazzo, Douglas V. Gold Confiscation. Safehaven. [2003-03-02]. （原始内容存档于2005-09-24） （英语）. ^ Willis, Kent. The Gold Confiscation Issue: History And Future Predictions. Safehaven. [2003-03-02]. （原始内容存档于2004-12-16） （英语）. 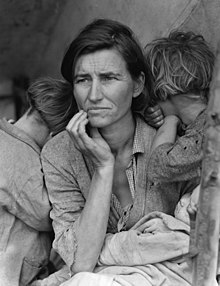 ^ Darby, Michael R. Three and a half million U.S. Employees have been mislaid: or, an Explanation of Unemployment, 1934–1941. Journal of Political Economy. 1976, 84 (1): 第1–16頁 （英语）. ^ Fried, Albert. 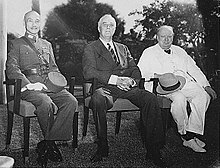 FDR and His Enemies. Palgrave Macmillan. 2001-01-06: 第120–123頁. ISBN 978-0312238278 （英语）. ^ Smiley, Gene. Recent Unemployment Rate Estimates for the 1920s and 1930s. Journal of Economic History. June 1983, 43: 第487–93頁 （英语）. ^ Presidents and job growth. 紐約時報. [2006-05-20] （英语）. ^ 達比計算WPA工人當作在職人口數；列伯卡德（Lebergott）則根據後面資料來源計算失業人數： Smiley. Historical Statistics US ((1976) D-86). 1983 （英语）. 與 Smiley, Gene. Recent Unemployment Rate Estimates for the 1920s and 1930s. Journal of Economic History. June 1983, 43: 第487–93頁 （英语）. ^ Pusey, Merlo J. F.D.R. vs. the Supreme Court 9 (3). American Heritage Magazine. April 1958. （原始内容存档于2006-05-07） （英语）. ^ Roosevelt, Franklin Delano. Quarantine the Aggressor. Wikisource. [2003-03-02] （英语）. ^ 71.0 71.1 Adamthwaite, Anthony. France and the Coming of the Second World War 1936-1939. Routledge. 1977-05-12: 209. ISBN 978-0714630359 （英语）. ^ Caputi, Robert. 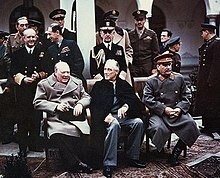 Neville Chamberlain and Appeasement. Susquehanna University Press. February 2000: 176 （英语）. ^ Keylor, William. VIII France and the Illusion of American Support, 1919-1940. (编) Joel Blatt. The French Defeat of 1940 Reassessments. Berghahn Books. 2001: 第234–235頁. ISBN 9781571812261 （英语）. ^ Committee to Defend America By Aiding the Allies Records, 1940-1942: Finding Aid. Princeton University Library. [2008-03-11]. （原始内容存档于2007-06-24） （英语）. ^ Churchill, The Grand Alliance（1977）at 119. ^ Watson, Mark Skinner. The Victory Program. 1950: 第331–366頁. （原始内容存档于2008-02-10） （英语）. ^ Wedemeyer, Albert C. Wedemeyer Reports!. New York: Henry Holt. 1958: 第63頁以後. ASIN: B000OLIH96 （英语）. ^ Fleming, Thomas. The New Dealers' War: F.D.R. and the War within World War II. 紐約: Basic Books. 2001: 1. ASIN: B000UD5ZWU （英语）. ^ Theobald, Robert. The Final Secret of Pearl Harbor. 紐約: Devin-Adair. 1954: 28. ASIN: B000H3U9II （英语）. ^ Sainsbury, Keith. 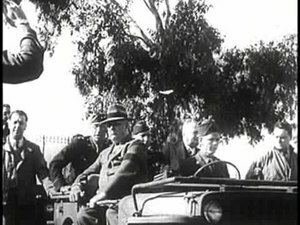 Churchill and Roosevelt at War: The War They Fought and the Peace They Hoped to Make. NYU Press. 1994-08-01. ISBN 978-0814779910 （英语）. ^ Bercuson, David, and Herwig, Holger H. One Christmas in Washington. Overlook TP. 2006-10-31. ISBN 978-1585678464 （英语）. ^ Roosevelt, Franklin. Aug. 24, 1944 message from F. D. Roosevelt to Winston Churchill. Warsaw Uprising Documents, Roosevelt Papers, Map Room Papers, Box 6. Project InPosterum. [2008-02-10] （英语）. I do not consider it advantageous to the long range general war prospect for me to join with you in the proposed message to U.J. [Uncle Joe]. ^ Patient.co.uk: Libman-Sacks Endocarditis. [2008-08-11] （英语）. 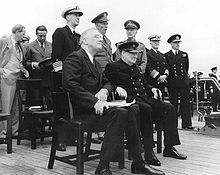 ^ Sailor was the piper of history 60th Anniversary of Historic Meeting between King Abdulaziz and President Franklin Delano Roosevelt. Saudi-US relations Information Service. [2008-03-02]. （原始内容存档于2007-09-28） （英语）. ^ USS Quincy CA-71. Navy History. [2008-03-02] （英语）. ^ Black, Conrad. Franklin Delano Roosevelt: Champion of Freedom. PublicAffairs. 2005-03-15: 1075. ISBN 9781586482824 （英语）. ^ President Roosevelt's Report To Congress On the Crimea Conference. New York Times. 1945-03-01 [2008-03-02] （英语）. ^ Lamb, Richard. War In Italy, 1943-1945: A Brutal Story. Da Capo Press. 1996-03-21: 287. ISBN 978-0306806889 （英语）. ^ 罗斯福去世希特勒曾欢呼：预料的奇迹发生了. 凤凰网. [2012年] （中文（中国大陆）‎）. ^ Ball, Howard. Hugo L. Black: Cold Steel Warrior. USA: Oxford University Press. 1996-09-12: 第9頁. ISBN 0-19-507814-4 （英语）. ^ Ball, Howard. Hugo L. Black: Cold Steel Warrior. USA: Oxford University Press. 1996-09-12: 第14頁. ISBN 0-19-507814-4 （英语）. Gvsu.edu. Grand Valley State University. （原始内容存档于2009-02-07） （英语）. David Gergen. On Faith: Guest Voices: When Presidents Deceive. 華盛頓郵報. 2008-05-13 [2009-01-20] （英语）. ^ Leuchtenburg, William E. Chapter 1. 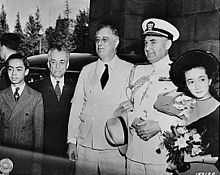 The FDR Years: On Roosevelt and His Legacy. Columbia University Press. 1995. ASIN: B000OPKU06 （英语）. ^ Schlesinger, Arthur Jr. Liberalism in America: A Note for Europeans. The Politics of Hope. 波士頓: Houghton Mifflin Company. 1962-01-01. ASIN: B001K24R5G （英语）. Nixon, Edgar B. ed. Franklin D. Roosevelt and Foreign Affairs (3 vol 1969)，涵蓋1933年至1937年。2nd series 1937–39 available on microfiche and in a 14 vol print edition at some academic libraries. Hakim, Joy. A History of Us: War, Peace and all that Jazz. New York: Oxford University Press. 1995: 100–104. ISBN 0-19-509514-6.